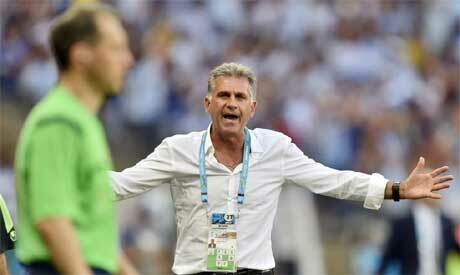 Carlos Queiroz has challenged Iran's football authorities to remove him from his post as head coach of the country's World Cup-bound national team if they do not appreciate his public criticism of preparations for next year's finals in Russia. Iran have been drawn to face Queiroz's native Portugal as well as Spain and Morocco in Group B, but the former Real Madrid coach has renewed calls for the country's authorities to do more to support his team's bid for a place in the second round. "I'm here to say Iran needs special local preparations," the 64-year-old said in a video posted on his Facebook page after Friday's World Cup draw in Moscow. "I don't care about the threats and what they have been trying to do to stop me talking. The Iranian fans deserve special World Cup preparations. We need to implement special preparations to bring honour and pride. "They can fire me, I don't care, but it's time to express my opinion because the Iranian fans deserve that and the players deserve full support to be ready for this competition." Queiroz has already fallen foul of Iranian authorities with his demand for more financial and logistical support for his team since they became the first Asian nation to book their ticket for Russia in June. But Alex Ferguson's former assistant remains a hugely popular figure with Iranian football fans after securing back-to-back World Cup qualifications for the country for the first time in their history. However, Iran have exited the competition at the end of the group stage on each of their previous four appearances at the finals and Queiroz has set his sights on a place in the Round of 16 in Russia. "The draw is very exciting and very attractive and could not be better," he said of the task that lies ahead of his team. "To play against Spain, Portugal and Morocco will be a great opportunity for our players to show why they are here and especially to show that they deserve to be here. "I'm sure we are going to do well. We are going to be competitive as always and no matter what happens in each game, I'm sure our fans will be proud and happy with the team. "From the players' point of view, I'm sure they are very excited to play against Portugal and Spain and also Morocco, because it's a unique and rare opportunity for Iranian players to play against such great players and such great teams."